Thank you for visiting to Our Website! Your project is the most important project we have on or schedule, so when you’re ready to excavate, landscape or maintain, get yourself the best Excavating, Landscape Contractor in the business! We’ve been in business for over 15 years, specializing in residential and commercial site development and service. All our experienced staff are certified and have been with us for at least 3 years. We only use the best materials available, and we hold ongoing training and safety seminars to ensure the procedures we use are up-to-date in style and technique. We serve the following counties: Elkhart, St. Joe, Kosciusko and LaGrange in Indiana and St. Joseph, Cass, and Berrien in Michigan. 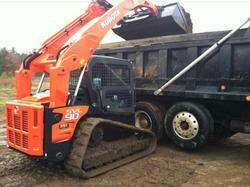 For all your residential and light commercial excavating needs, contact ABC Excavating. From site preparation and septic systems to new lawns and maintenance, we offer a full line of excavating and landscaping services to meet your needs. "Very professional, Great prices. Good job!"